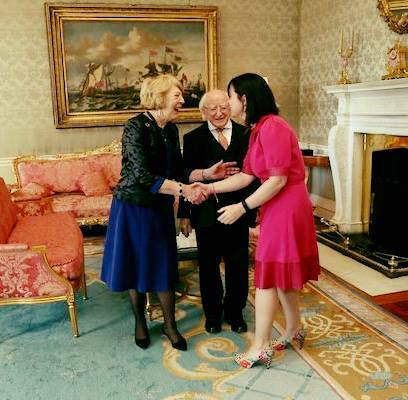 COGNIKIDS founder and CEO, Ollwyn Moran, was invited along to meet the President of Ireland early in May 2018. 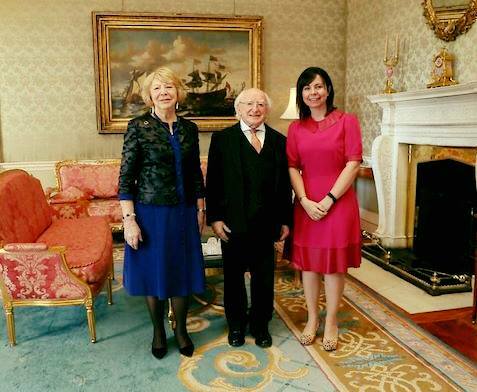 The multi-award wining Dublin based brand, Cognikids, are delighted to announce that their founder, Ollwyn Moran, was invited to meet the President, Michael D Higgins, and his wife, Sabina, in Aras an Uachtarain last Friday, 4th May. Ollwyn was part of a small group of female entrepreneurs leading the way in business and innovation, that were invited to attend a reception in the Aras to celebrate their achievements. As some of you may know already, Ollwyn originally was a secondary school teacher in St. Marks Community School in Springfield in Tallaght. She also lectured for Hibernia College and Trinity College Dublin. Since then she has gone on to develop the company COGNIKIDS – creating products that aid babies development in the modern world. Indeed the company has a number of global patents and Trademarks under its belt and a whole host of awards from consumer and industry professional bodies. The event was a very glamorous affair with all the top females in business in attendance. A wonderful speech was given by the President celebrating and supporting women in business and the need for continual focus on diminishing discrimination in all areas of life including for women in business. If you follow the link below you will see his fantastic speech and some video and other images of the wonderful event. Julie Sinnamon, CEO of Enterprise Ireland was also in attendance and gave a short speech reminding all the attendees of the importance to the economy that female lead companies were. And also congratulated Norah Casey, also in attendance, on her recent successful trip to India to further highlight the need for equality in women. COGNIKIDS is already popular in 15 countries including Japan, Singapore, Korea, and is set to take the UK baby market by storm when it launches their innovative multi-award winning products there in the coming weeks. COGNIKIDS are already successfully retailing in Mothercare, EuroBaby and Boots Pharmacy and other great independents and they continue to grow. 2018 looks set to be a very exciting year for the young company. Keep an eye out for their products in a pharmacy or nursery store near you. This entry was posted in COGNIKIDS Experiences and tagged Aras an Uachtarain, baby, baby products, cognikids, development, Dublin, emma manley, made with manley loving care, manley dress design, Michael D Higgins, multi award winning, Phoenix Park, President of Ireland, Sabina Higgins.